The UL50VF is a 15.6 inch CULV laptop from Asus with the integrated Optimus technology which allows the laptop to automatically switch between graphics cards and optimize performance. 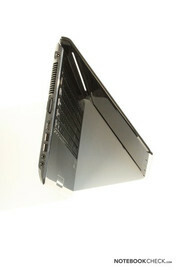 The notebook appeals to buyers with its long battery life, low emissions, and, for a 15.6 inch laptop, light weight. We will discuss how the Optimus UL50VF performed in our tests further in our in-depth review. 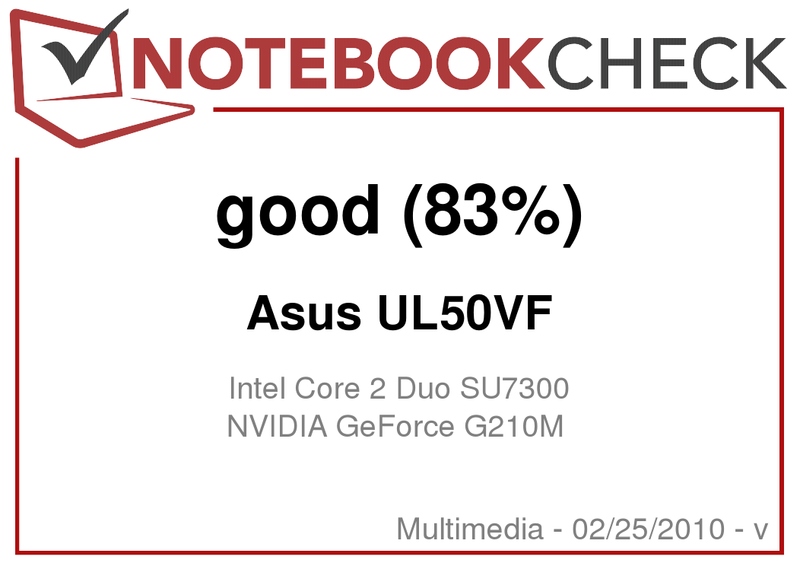 Parts of this review are based on our report on the Asus UL50VT (silver and without Optimus) which is practically identical to the Asus UL50VF. Most of the case of the UL50VF is made of a simple, synthetic material. The aluminium finish on the display cover is an interesting "Eye-Catcher" and unlike the UL50VT, the UL50VF is completely black. The design is simple and modern. The workmanship and the lacquer job on the case are both of good quality, and despite the use of synthetic material, overall the case seems to be of high quality. However, the glossy surface of the hand-rest regions gets dirty very easily due to fingerprints and smudges and has to be constantly cleaned. 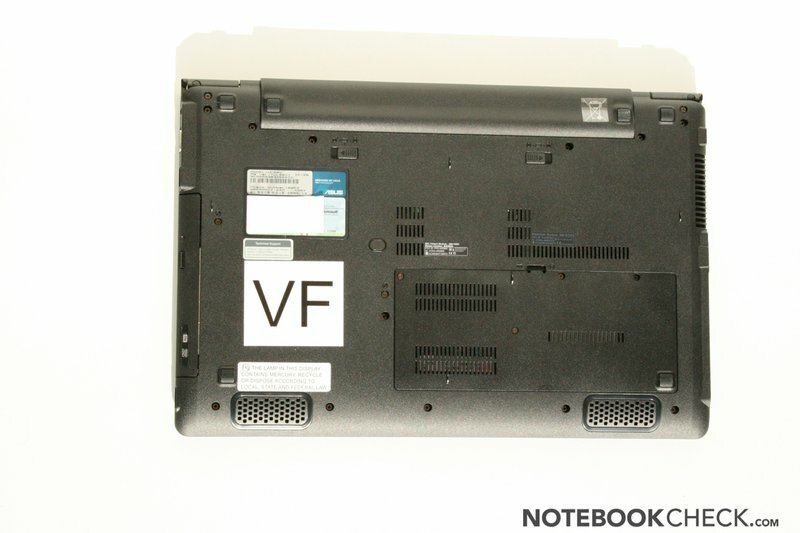 The UL50VT weighs 2.4 kilograms (which is light for a 15.6 inch notebook) and measures 386 x 259 x 16.4 - 26.4 millimeters (width x length x height). The UL series is especially pleasing to the eye due to its slim design, as the thickest part of the laptop is only 2.64 centimeters. The Timeline series from Acer is also comprised of slim laptops. A comparable notebook would be the Samsung X520 laptop. The case is relatively sturdy despite the slim design. The case only gives way when placed under a lot of pressure at a single point. 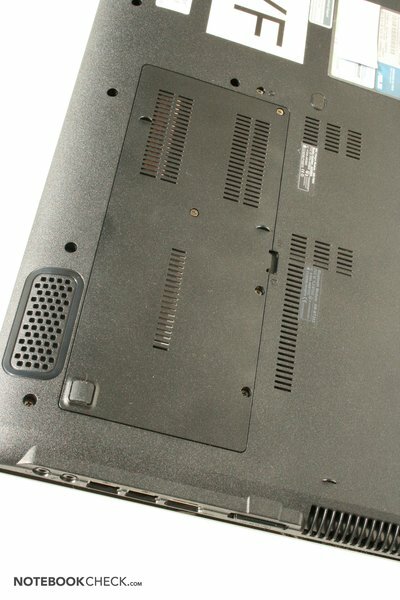 However, the keyboard region of the case is the weakness of the UL50VF. This part of the case can be easily bent inwards. The display cover is not very sturdy, despite the use of aluminium. That is probably due to the slim screen with the LED-backlight. The display hinges are strong and well-dimensioned, and due to their strong attachment they can hold the display up well. 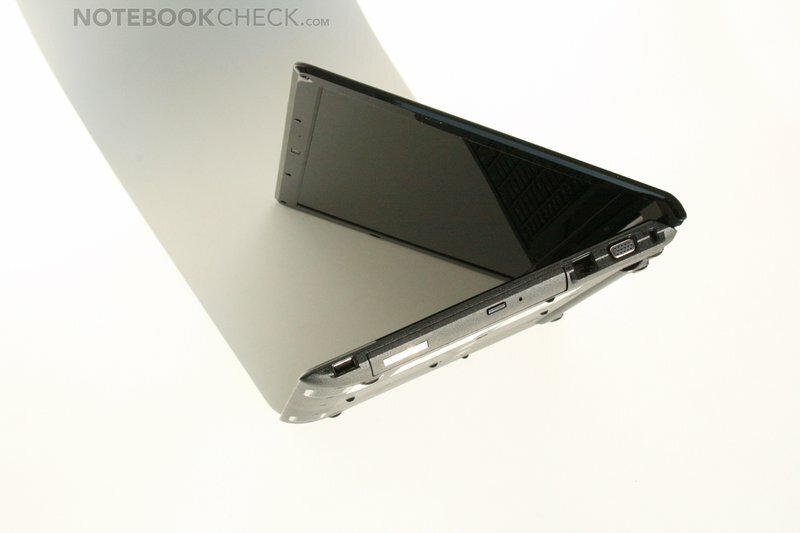 The hinges also allow the laptop to be opened up to a maximum angle of 140 degrees. The case underside is a matt black and has only one cover flap. 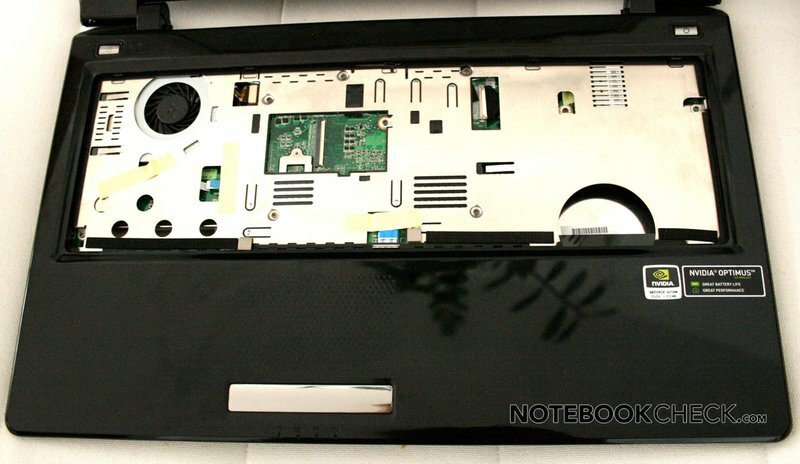 The 2.5" HDD (hard disk drive) and the 2 x 2 GB DDR3 RAM modules are installed under this flap. 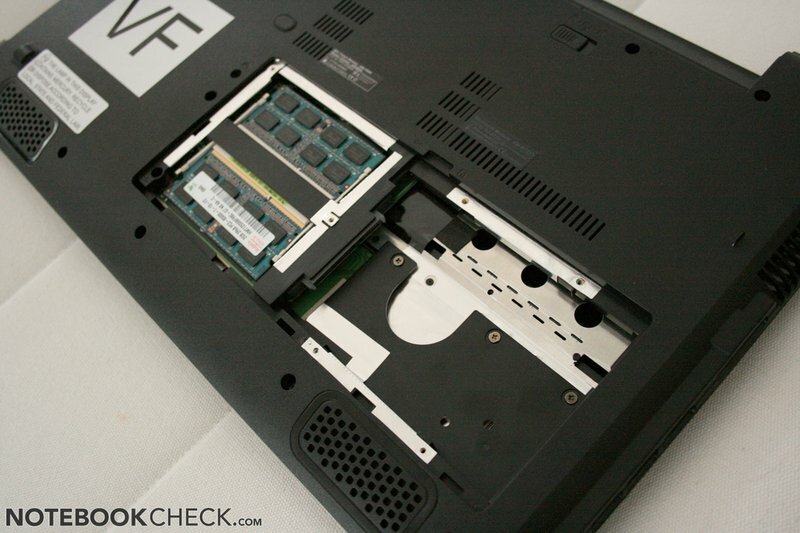 According to Asus, the laptop can only support up to 4 GB of RAM, and the user can install any typical 9.5 millimeter laptop HDD with a SATA-II interface in the UL50VF, if s/he wishes to replace the original HDD. 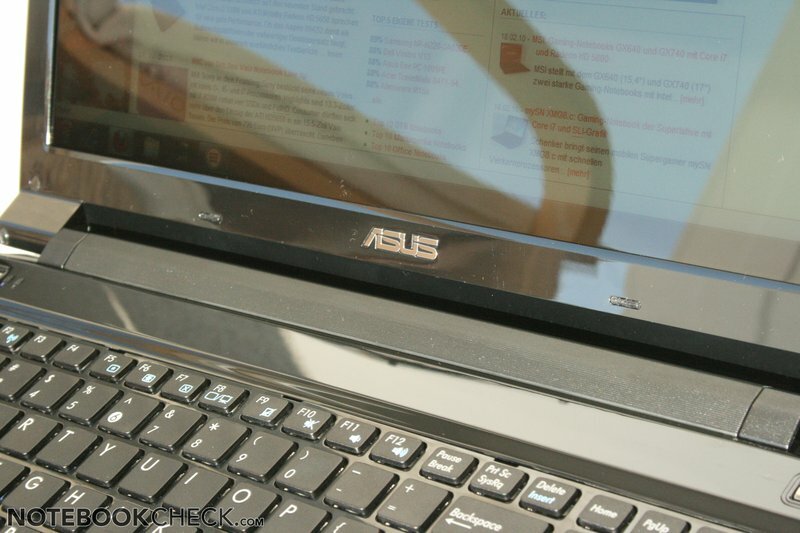 The Asus UL50VF offers ports typical to its laptop class. On the left side, we have two USB 2.0 ports, audio ports (headphones and microphones plugs), a 5-in-1 cardreader (SD, MMC, MS, MS-Pro, xD), the power supply outlet, and a HDMI-port over which the user can connect external monitors and televisions. 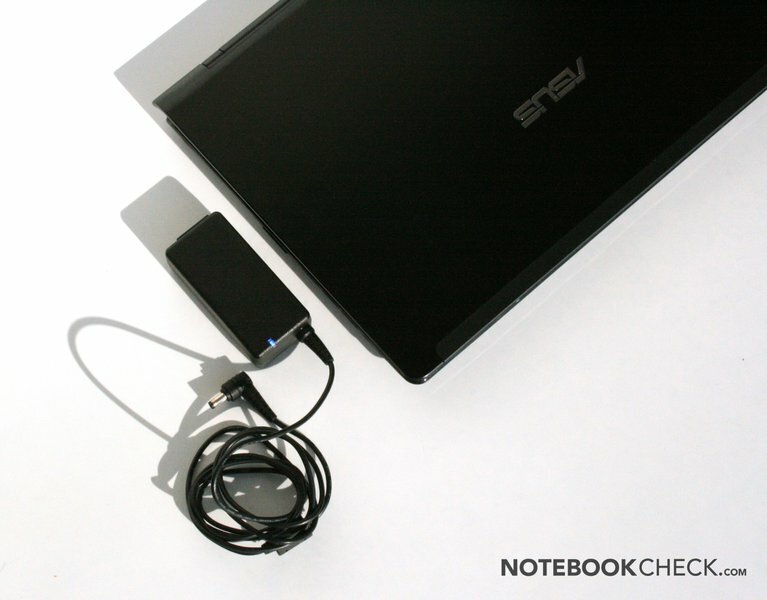 The use of HDMI makes video transmission between the notebook and an external display device easier, as it allows for the transmission of both picture and audio through one cable. On the right side of the laptop there is one more USB 2.0 port, an analogue VGA interface, a RJ-45 LAN port, a Kensington lock, and a super-multi-DVD optical drive (UJ892AS) from Matshita. Older external monitors and a variety of beamers, which do not use HDMI, can be connected to the UL50VF via the VGA port. Asus left additional ports, which support peripheral devices, such as e-SATA, ExpressCard slot or FireWire, out of the UL50VF. 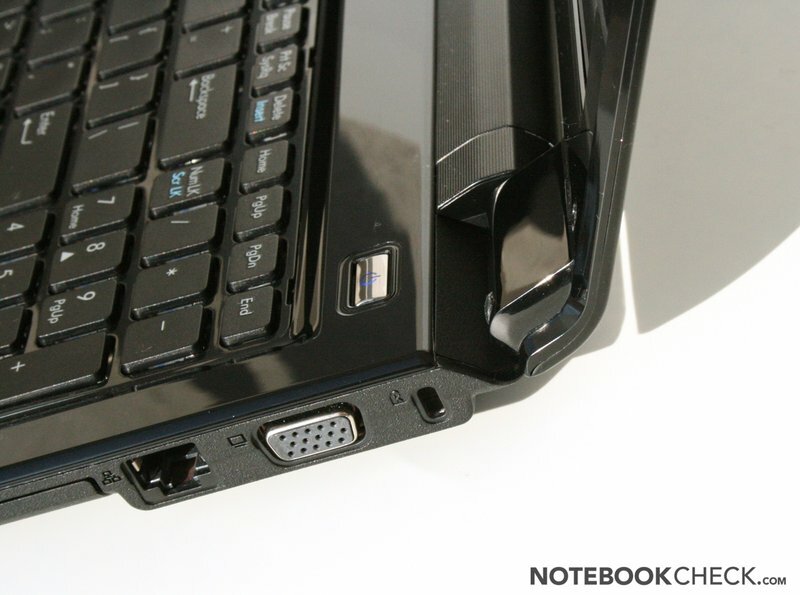 So the ports offered on the laptop are the typical assortment found on most notebooks, and the lack of additional, useful ports is probably due to the flat design of the case. 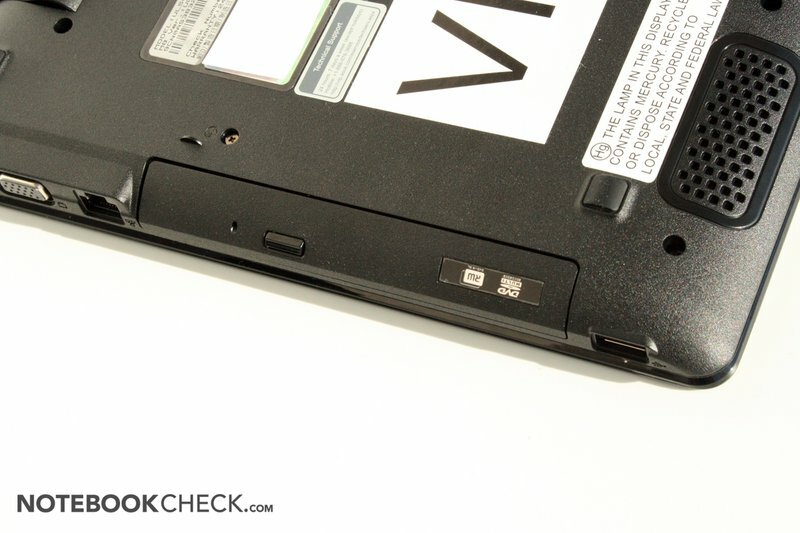 The ports of the Asus UL50VT are all placed on the sides of the notebook due to the low display hinges and the flat design of the laptop. 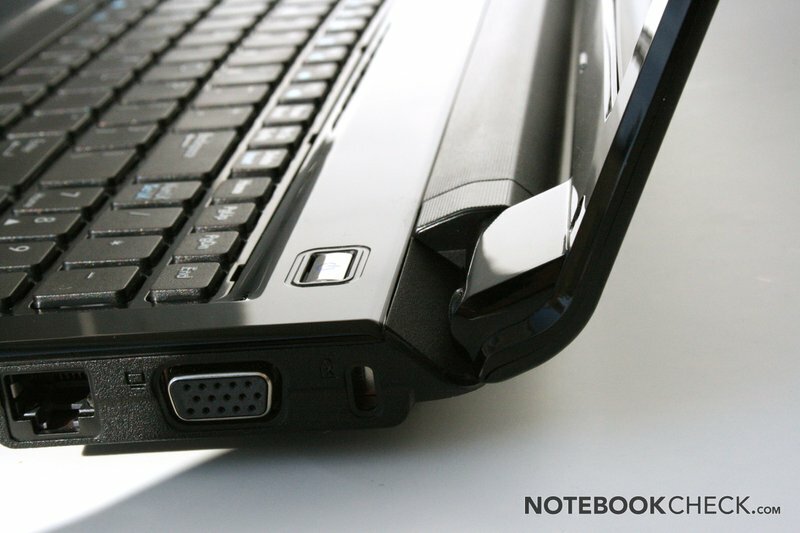 The placement of most of the ports on the left side of the notebook is especially advantageous for right-handed users. The wireless communication technology of the UL50VF has absolutely no flaws. A WLAN adpater from Atheros (AR9285) which supports the 802.11n standard and an integrated Bluetooth module allow the laptop to transfer data between the laptop and peripheral devices without any wires. Our U.S. "Pre-Sample" from Asus came with two printed manuals (a user manual and a short introduction to the UL50VF with 24 pages), and a booklet about Express Gate Linux, which, sadly, does not work on our test model. The package also includes a drivers CD, the 64-bit version of Windows 7 Recovery DVD and PowerLink Power2 Go 6.0. The package is rounded off with a cable management band. According to the guarantee booklet, the UL50VF has 2 years international guarantee while the battery has a guarantee of 1 year and a 30 days 0 Dead-Pixel policy. The integrated VGA webcam does not offer a great picture quality but it suffices for normal video conferencing in a well-lighted environment. The Power4Gear Hybrid tool from Asus allows the user to easily change the most important energy functions of the notebook, and even to activate the "Turbo" overclocking function, which increases the CPU clock frequency from 1.3 to 1.7 GHz. There are a variety of other small tools (for example, to change the start screen) and the only one of them which is worthy of mention is the LifeFrame program. This allows the user to take photos with the webcam and then add special effects to them. It is similar to Apples PhotoBooth. Due to the width of the 15.6" case of the UL50VF, the keyboard also has a separate number block integrated into it. 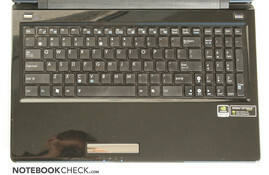 The keys of the keyboard have a medium short key travel and a user-friendly layout. The distance between any two keys is at least a few millimeters in a grid of 19x19 millimeters, and the keys themselves have a surface area of 16x16 millimeters. However, the surface lying under the keyboard can be bent inwards easily and, so, the keyboard feels rather unstable during typing. 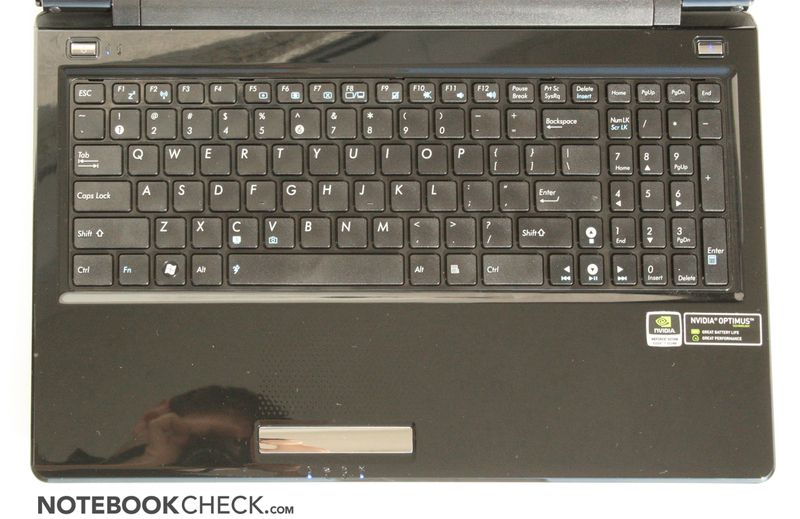 The power button of the notebook can be found on the right side above the keyboard. On the left side, there is a switch for the switching the graphics. However, in the Optimus version of the UL50V, this switch has no function at all. The special functions of the laptop can be accessed via a combination of the "Fn" key and a specially assigned key on the keyboard. 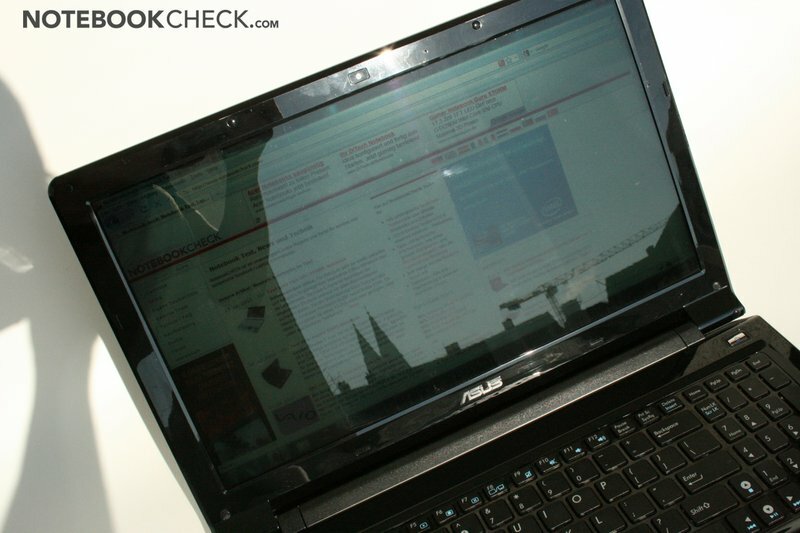 The touchpad of this ultra thin laptop from Asus does not lie on the central vertical axis, instead, it is stylishly placed below the keyboard and a little to the left of the axis. The surface of the touchpad is also rather unique due to its unique use of various, small nobs. These nobs have been planted on the touchpad for two reasons: they are supposed to help the user distinguish between the touchpad and the rest of the glossy surface surrounding the keyboard, and they also have better sliding properties than the black lacquer used on the laptop. Still, subjectively seen this surface is only mediocre at best. 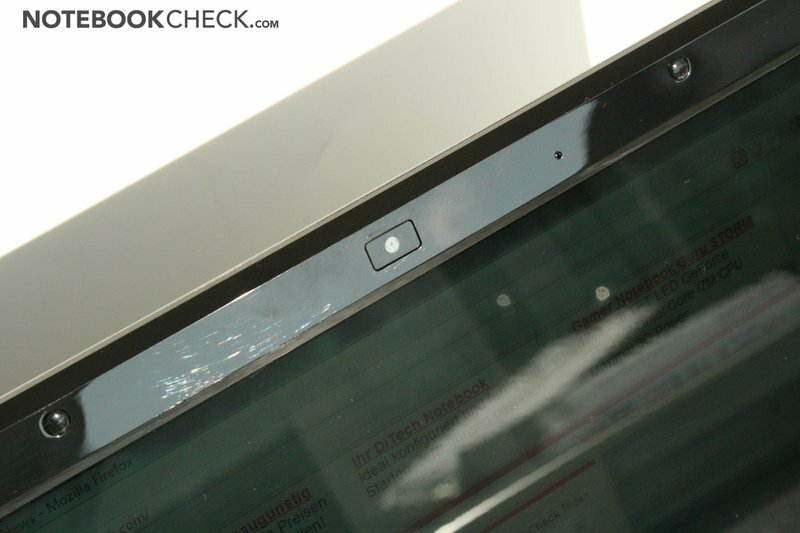 The touchpad area is marked by the tiny nobs which makes it hard to find it without looking. 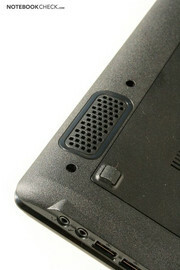 There is a single bar under the touchpad which accommodates the two mouse buttons. The key is very easy to use, however, it only recognizes clicks of either end of the bar. This prevents the user from easily using the touchpad as most of the time the touchpad does not acknowledge the press of the key (this is especially the case for the left side of the bar). This touchpad supports ELAN PS/2 "Smart-Pad" multi-touch functions, as do most of the other modern touchpads. Apples 2 finger scrolling system works better on this touchpad than on that of other Windows notebooks, but it is still not as good as that of MacBooks' which use MacOS X. The touchpad software by Elan even allows the user to "tap" the surface of the touchpad with two to three fingers at a time (This is set for the middle mouse key and the context menu by default, but it can be changed). The UL50VT comes with a 15.6 inch screen with LED backlight and a maximum resolution of 1366x768 pixels. Contrary to the display of the UL50Vt-XO037V, the display of our test model of the UL50VF has a glossy surface. This display has a native resolution of 1366x768 pixels and is HD-ready. This feature is especially important for multimedia notebooks as due to high resolution and widescreen format the playback of a video can leave small black bars at the edge of the screen. The brightness of the UL50VF is about 200 cd/m², which is significantly higher than the brightness of the matt display in the UL50VT. The higher brightness level is sadly necessary to balance out the annoying reflections. However, this level of brightness is not enough for use outdoors. The brightness of the display has 15 levels (the lowest level has a brightness of 9.6 cd/m²) and if the user wishes so, the backlight can be switched off completely via a special "Fn + key" combination. This allows the UL50VF to run for a longer time. However, in our test model we could not switch the display off via the "Fn + key" combination and had to first turn this option on in the Asus "Power4Gear Hyprid" tool. 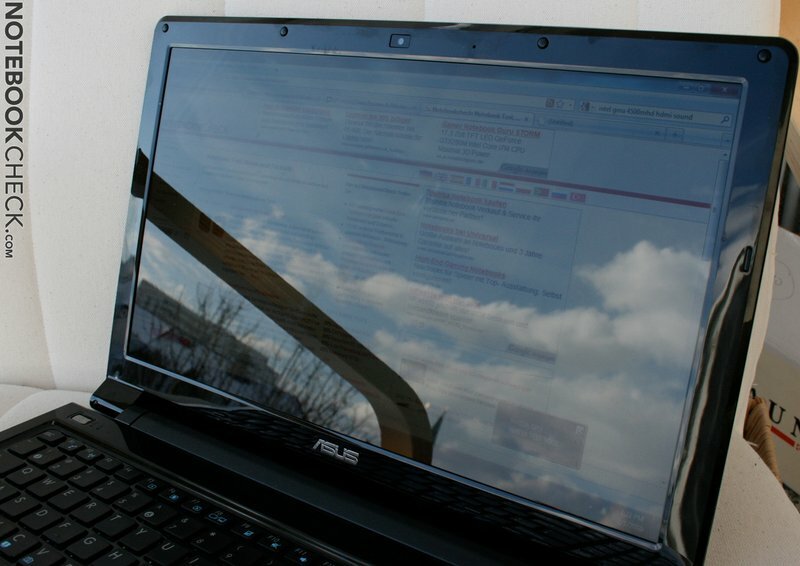 The contrast of the screen has a ratio of 145:1 at a brightness level of 100 cd/m². This is a rather weak value and the contrast at the maximum brightness is a mere 127:1. These low values are due to the high black values of every brightness level. Due to this the picture seems less brilliant. Due to the glossy display of the Asus UL50VF, the outdoors use of this laptop would not be advisable. Most of the time one can not even determine the content being displaying on the screen because of the reflections dancing on the display. The stability of the viewing angle was below average in our test. Even the slightest change in height could lead to a drastic change in the colours. 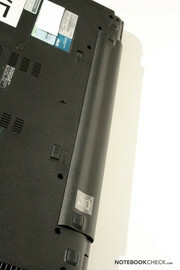 However, from the side the colours displayed on the TN panel of the laptop are okay. The Asus UL50VF is equipped with a Intel Core 2 Duo SU7300 energy-saving processor which runs at a native frequency of 1.3 GHz but can be overclocked to higher levels. Asus delivers the UL50VF with an overclocked version of this CPU so that the CPU is overclocked from the start. The CPU runs at 1.73 GHz in our test model and, from its performance in the Cinebench R10, we can estimate that it can perform as well as a 2.0 GHz Core 2 Duo P7350 (for example, Acer Aspire 5739G). The UL50VF managed to score very high even in the PCMark Vantage benchmark, due to its fast hard disk drive and the nearly always optimal graphics usage, which is all thanks to Optimus. 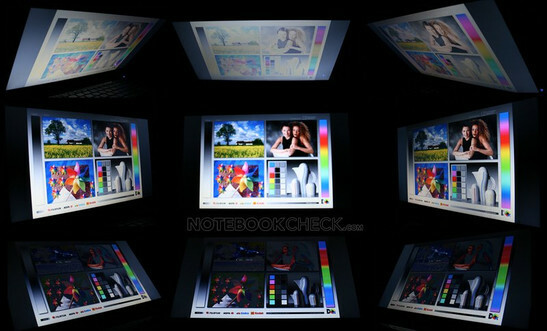 Additionally, the notebooks score is the same level as that of laptops with much stronger processors. The performance of the overclocked Core 2 Duo is good enough for everyday work such as word editing and such. A modern graphics card can decrease the CPU usage during the playback of videos. Optimus decides automatically which graphics card is best for which video. For example, Optimus switches to the G210M when playing Flash HD videos. This graphics card can even play 1080p videos on YouTube smoothly (with Flash 10.1 Beta). 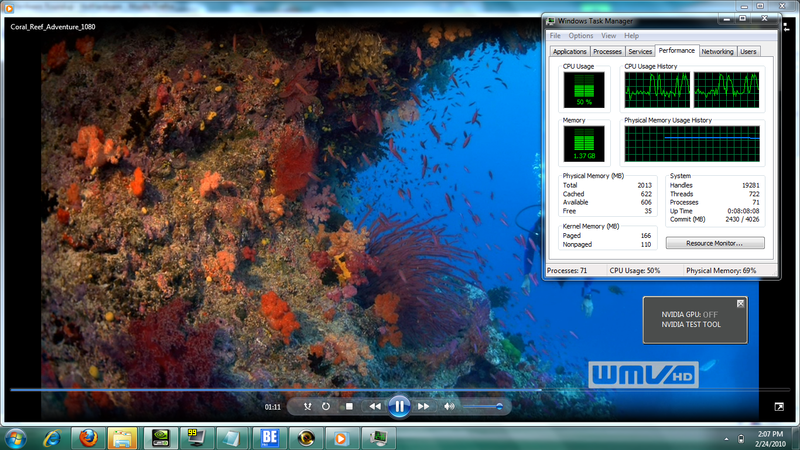 A WMV 1080p test video (Coral Reef Advanture) ran immediately on the GMA and that led to high CPU usage. In this case the use of the GeForce graphics card would have been a better choice. 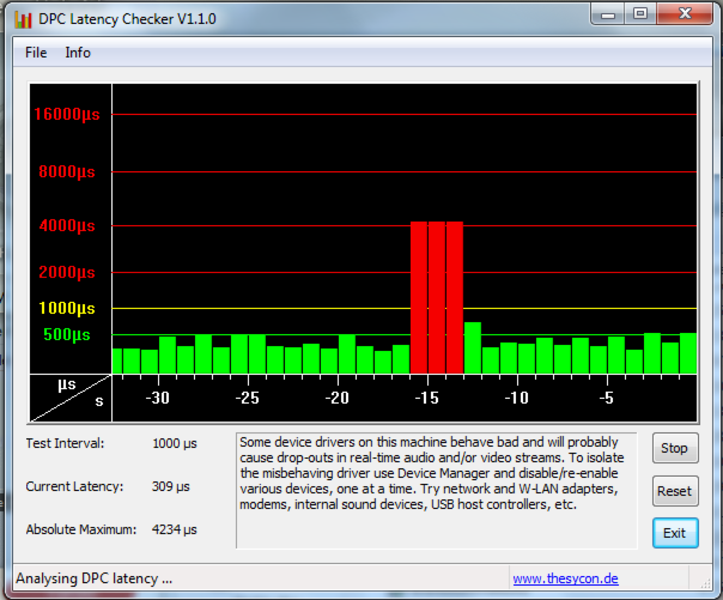 The DPC latency times were constantly disturbed by high anomalies which can lead to disruption of the data flow between an external device (such as a sound card) and the laptop. 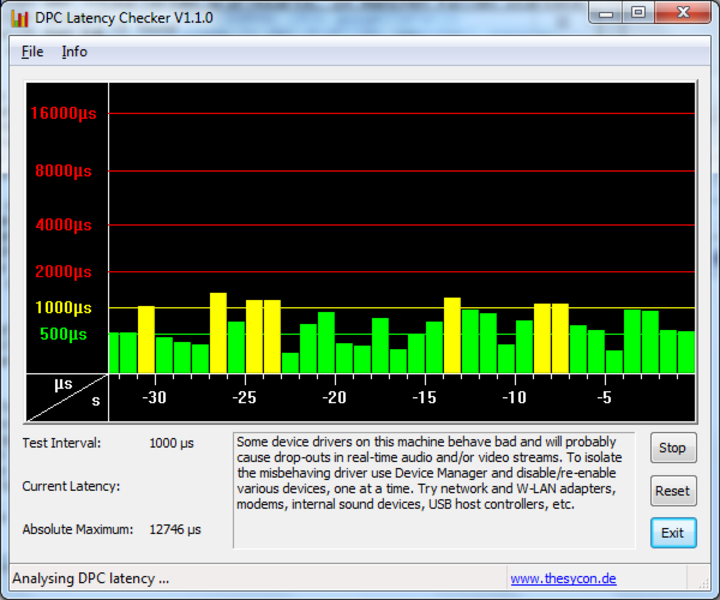 However, these disturbances went away as soon as the WLAN and Speedstep were deactivated (except for a few exceptional aberrations). The Windows 7 performance index is being run with the current Optimus drivers and the integrated GMA 4500MHD, and so the graphics scores are rather low. The 5400 rotations per minute of the 320 GB hard disk from Seagate achieved very good results in the data transfer test and could even beat the performance of some 7200 rpm HDDs. 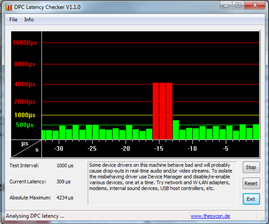 The noise emission was noticeable but not disturbingly high. The user should not expect high gaming performance from the Asus UL50VT due to the energy-saving CULV processor and the low-level graphics card. The GeForce G210M fought through our tests valiantly and managed to score decent fps (frames per second) in most games. The details level and the resolution were both on the lowest levels and so the games were not optically great, for example, Crysis seemed like Far Cry 1. Less performance-hungry games like Fifa 10 could be run on the notebook on a higher detail level at a fluid fps (50 fps with 1024x768 in our test). For more details on the gaming performance you can read more here: graphics performance of the G210M. 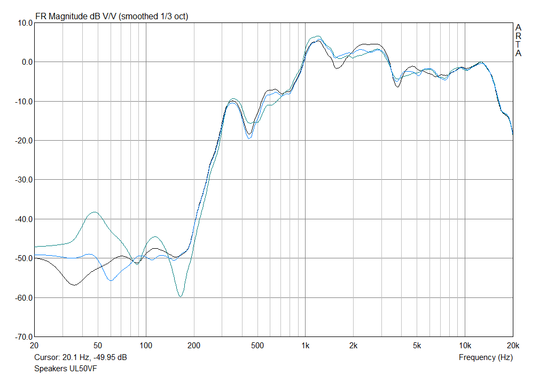 The G210M is significantly stronger than the integrated GMA 4500MHD, as is obvious from our test results. For example, the GMA 4500MHD could only run Call of Duty Modern Warfare 2 at 16 frames per second, whereas the G210M ran it at 56 fps. Thanks to Optimus the notebook can switch to the G210M immediately when the user starts a game. The Asus UL50VF is the first notebook to integrate the Optimus technology which allows the laptop to automatically switch between graphics cards and optimize performance, battery life and notebook emissions. Further technical details and our tests on it can be found in our detailed article of the Optimus. The HDMI port of the UL50VF is a special feature. This port is connected to the G210M graphics card and can only be used when the GeForce graphics is active. 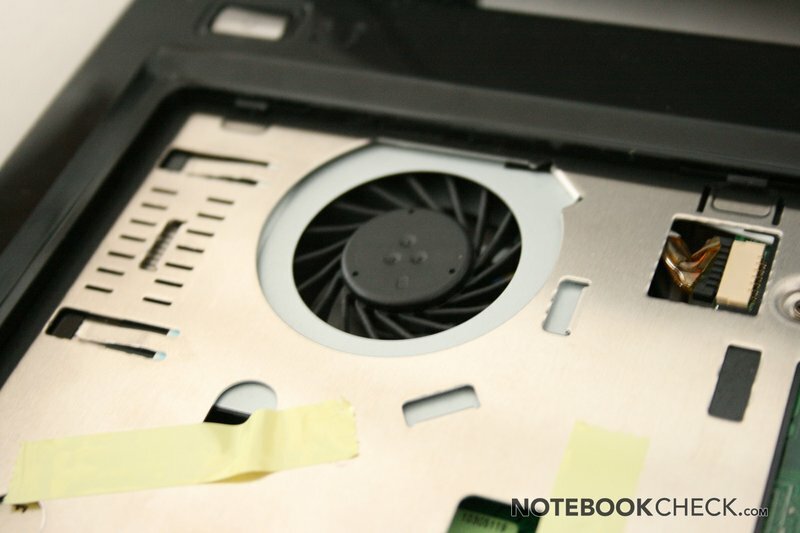 When the laptop is idle - for example, like surfing without videos - the cooler fan remains switched off and the only noise comes from the 2.5 inch hard disk drive. 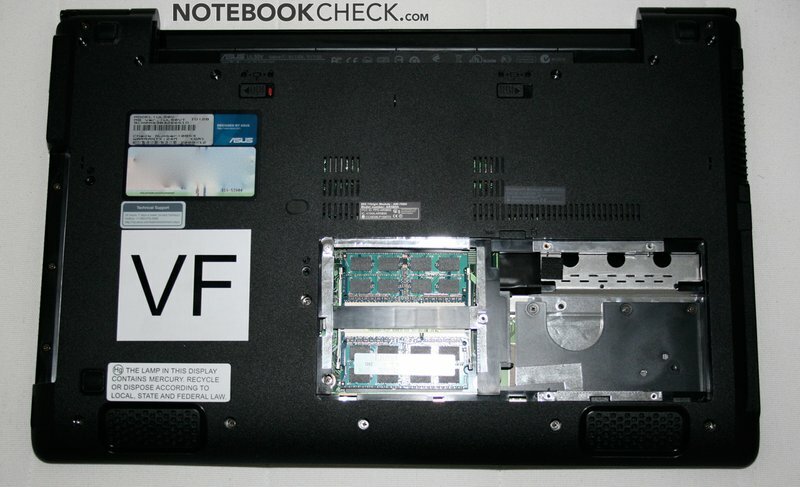 If the notebook used a SSD instead, then the laptop would make no noise at all in this mode. Still, the hard disk is very quiet most of the time and the noise only increases when data on it is being accessed. Still the noise remains very low. The following measurements were taken 15 cms away from the laptop: the HDD emitted 31.5 dB when idle and 32.6 dB when it was being accessed. So the laptop is quiet enough to be used in environments which require silence, such as, for example, a library. As soon as we started a HD video, the laptop cooler fan started up too. However, on the lowest level, the fan remains barely audible. Under heavy CPU usage, the integrated cooler system can become clearly audible but not distracting as such. 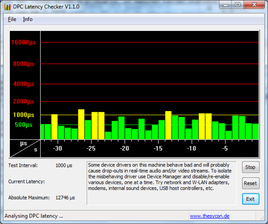 The noise emission stayed at 34-37 dB during the 3DMark06 and these are good values. 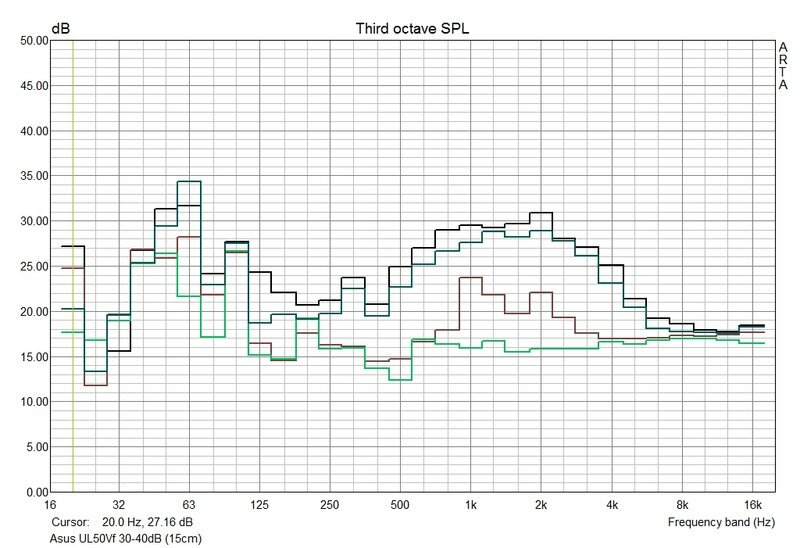 The maximum noise emission which we could measure was 40 dB but in this case we had been running both the Furmark and the Prime95 for quite a long time. Thanks to the CULV processor, energy-saving graphics chip and of course Optimus the UL50VF remains exceptionally quiet and is especially desirable to noise-sensitive users. While surfing on the web with the integrated GMA, the cooler fan remains completely switched off. 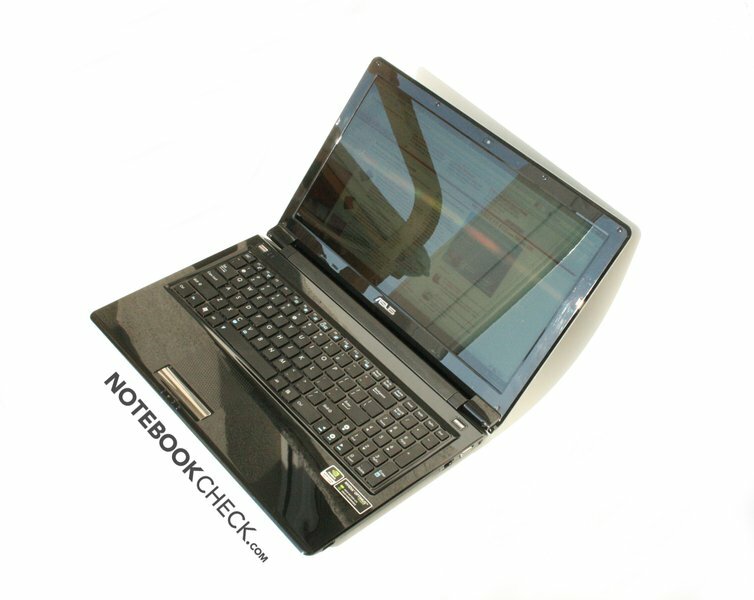 Even regarding temperature the slim multimedia notebook can score points. A maximum of 40°C after many hours of full load (Prime95 + Furmark) is excellent. The palm rests stay noticeably cool (28-30°C). Using the notebook on the lap for a longer time is no problem as the temperature is only 35° Celsius on average. After some hours running Prime95 (for the processor) and Furmark the temperatures in the inside stayed in the green. 74°C for the CPU cores and 72°C for G210M are harmless and far lower than the possible maximum. So, it is not a surprise that the UL50VF could run 3DMark05 without performance loss immediately afterwards. The 15.4 inch CULV notebook had a surface temperature of 35°C, when not under heavy CPU usage, and thus remained slightly cooler. This was possible due to the Core 2 Duo running at 800 MHz (without Asus overclocking and Speedstep) and switched off GeForce G210M. The built-in speakers emit the sound waves downwards and are placed at the front of the laptop. 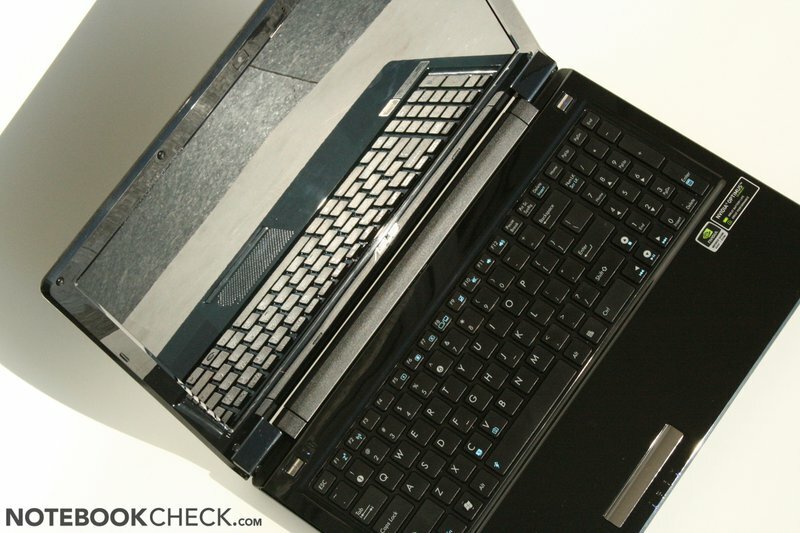 The quality of the sound is therefore very dependent on the material the laptop is placed on. Listening to music is rather dull as there is no bass, but, thankfully the maximum loudness of the speakers is high enough for the user to be able to watch films properly. The headphone port delivers good audio quality without any disturbances. 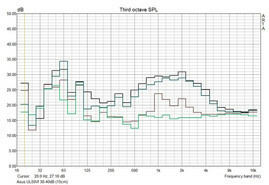 We deactivated the SRS Premium Sound function in the properties of the loudspeaker as this distorted the music output. Thanks to the big 84 Wh battery, the energy-saving CULV processor and the 40 nm low-level GeForce G210M, the run times are relatively high. The minimum run time of the laptop lies at 4 hours and the maximum run time is 8 hours and 20 minutes. The laptop lasts up to 4 hours when playing a DVD and that should be enough for the playback of two DVDs. When simply surfing on the internet and playing Flash videos the battery managed to last 6 hours and 20 minutes, during which time the G210M switched on and off occasionally. The battery was fully charged in 3.5 hours when the battery was being charged with the laptop partially in use. The automatic switching of the graphics cards thanks to Optimus helps increase the battery life and achieve the optimal performance of the laptop. This is the true strength of Optimus. The Asus UL50VF has a very balanced power consumption thanks to Nvidias Optimus. 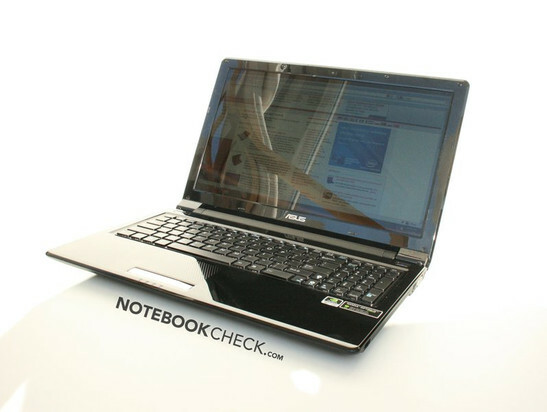 When the CPU is not under heavy usage and the Intel graphics card is in use, the power consumption of the laptop lies in the same region as that of Intel Atom N270 netbooks. This is especially low, and for those users who wish to conserve even more power, the display backlight can be manually switched off. 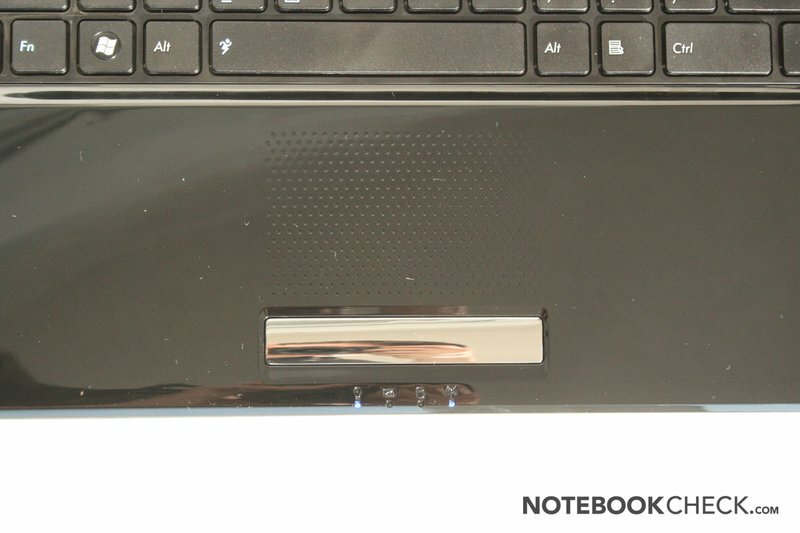 In standby mode, the notebook only consumes 9.5 W (1 watt less than when the notebook is in use with minimum brightness). The switch to the integrated GeForce G210M increases the power consumption by 3 W when the CPU is not under heavy usage. Under heavy CPU usage the power consumption shoots up noticeably and is on the same level as that of a 13 inch MacBook Pro with a stronger processor. The modest overclocking capability of the energy-saving CPU should help in this area. The switch to the GeForce graphics card in this case can consume from 5 to 9 watts. When switched off the Asus UL50VF only consumes 0.1-0.2 W and when in standby mode it uses up to 0.5 W, so, even when not in use it manages to keep the energy consumption low. 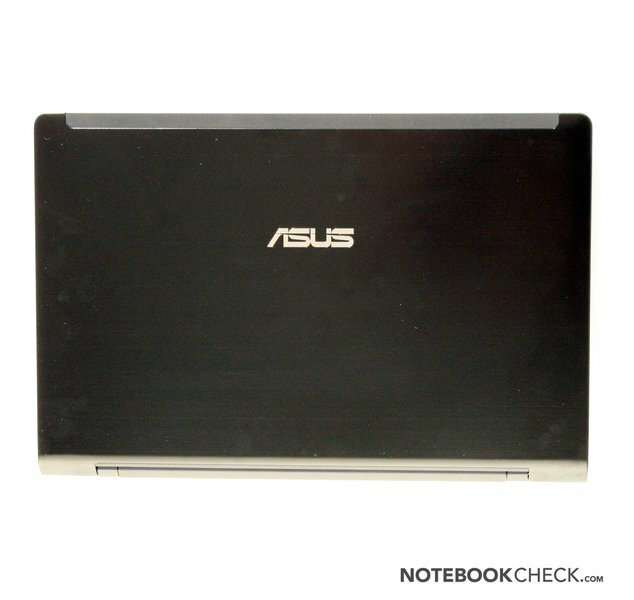 The Asus UL50VF-A1 is overall a good, slim and relatively light 15.6 inch multimedia notebook with a aluminium finish on the display case. However, the glossy surfaces on the inner areas are almost always covered with smudges and fingerprints and this makes the inner areas rather unfriendly to the user. The glossy 15.6 inch display is a big weakness of the notebook, as the contrast is very low and the viewing angles are not very good. 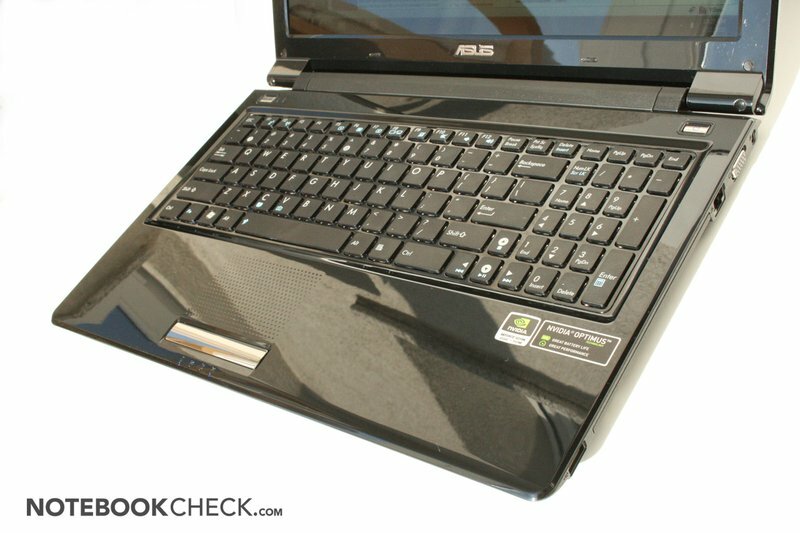 Asus delivers one of the first notebooks ever to successfully integrate the Optimus technology, which allows the UL50VF to automatically switch between graphics cards. 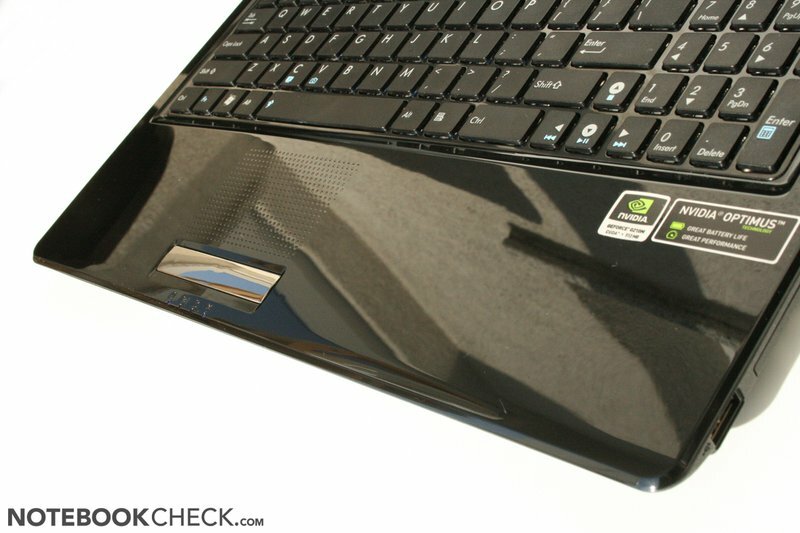 Although the GeForce G210M is relatively slow, it still performs much better than the weak integarated GMA 4500MHD graphics chip and adds to the notebooks value. Optimus works nearly flawlessly and is definitely going to be a future "Must Have" feature for laptops with a dedicated graphics card. The performance of the CULV processor can perform at up to 1.7 GHz thanks to the "Turbo" overclocking feature from Asus. The performance of the CPU suffices for most tasks, but gamers will not be completely satisfied with the combination of the CULV CPU with a G210M graphics card (although surprisingly enough a lot of games run fluidly on the laptop). The biggest advantages of the Asus UL50VF, besides the Optimus technology, are the great battery life, low case temperatures, and very low system noise emission. 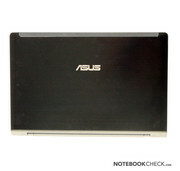 The Asus UL50VF is a slim and light 15.6 inch multimedia notebook. They are directed downwards and offer no bass. 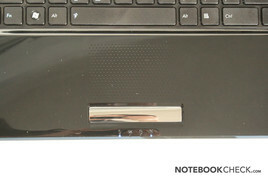 Asus had to leave out some ports due to the flat case of the notebook. ... and allow the display to be opened sufficiently. The small power adapter fits easily into the bag. 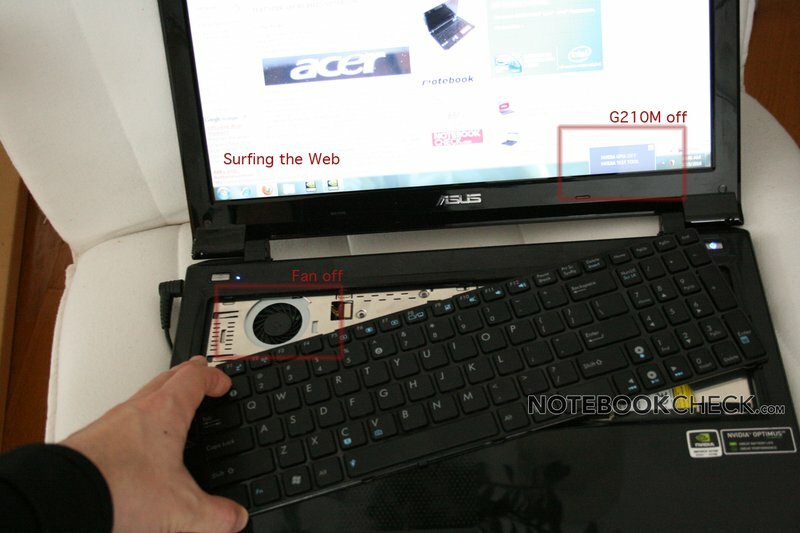 The cooler fan does not switch on when the laptop is not under intensive use. ... it remains very quiet. The user can unintentionally end up opening the DVD optical drive. The button, which is designed to switch between the graphics cards of the UL50VF does not work in Windows. The big Li-Ion battery lasts for 6 hours. Thanks to NVidia Optimus, the Asus UL50VF is always using the right graphics card for the job. The built-in speakers offer a modest audio quality. The keyboard bends inward slightly when it is being used. ... and a aluminium cover behind the display. ... when it has been cleaned. 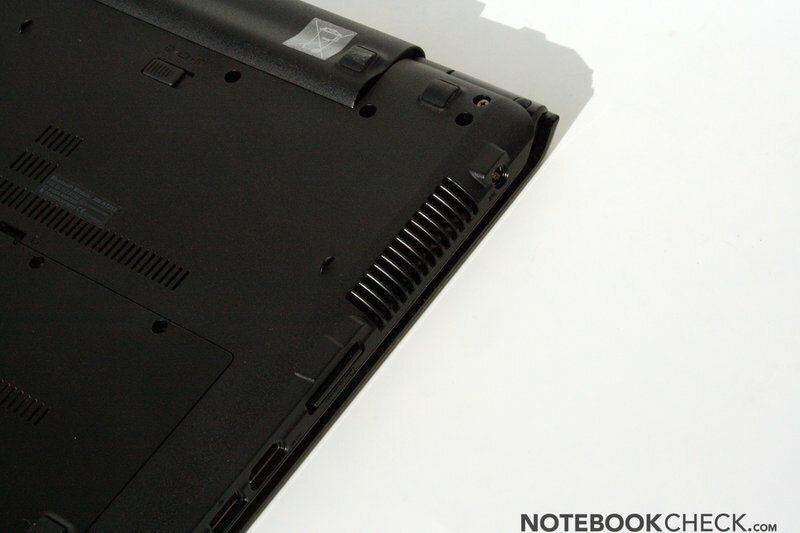 The CULV processor makes the slim design of the laptop a reality. Only one cooler fan cools the graphics card and the processor. The display can give off many distracting reflections. The webcam offers decent picture quality. The touchpad is capable of multi-touch functions. Thanks to Optimus the laptop automatically switches between the integrated graphics cards and thus has very balanced emissions and battery life. More performance and a matt display like in the UL50VT. 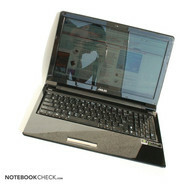 The CULV concept has been adapted to the 15 inch notebooks. Obviously the other UL50Vx models, like, for example, the UL50VT, but also the Timeline series from Acer.